For mobile applications our starter kits provide all the gear you need to get strapping! 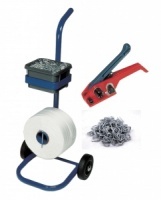 High quality sturdy dispensers, tools and great range of sizes and types of strapping to suit most requirements. More new strapping kits coming soon!